Higher blood-sugar levels, even those well short of diabetes, seem to raise the risk of developing dementia, a major new study finds. Researchers say it suggests a novel way to try to prevent Alzheimer's disease — by keeping glucose at a healthy level. Alzheimer's is by far the most common form of dementia and it's long been known that diabetes makes it more likely. The new study tracked blood sugar over time in all sorts of people — with and without diabetes — to see how it affects risk for the mind-robbing disease. The results challenge current thinking by showing that it's not just the high glucose levels of diabetes that are a concern, said the study's leader, Dr. Paul Crane of the University of Washington in Seattle. "It's a nice, clean pattern" — risk rises as blood sugar does, said Dallas Anderson, a scientist at the National Institute on Aging, the federal agency that paid for the study. "This is part of a larger picture" and adds evidence that exercising and controlling blood pressure, blood sugar and cholesterol are a viable way to delay or prevent dementia, he said. Because so many attempts to develop effective drugs have failed, "It looks like, at the moment, sort of our best bet," Anderson said. "We have to do something. If we just do nothing and wait around till there's some kind of cocktail of pills, we could be waiting a long time." About 35 million people worldwide have dementia; in the United States, about 5 million have Alzheimer's disease. What causes it isn't known. Current treatments just temporarily ease symptoms. People who have diabetes don't make enough insulin, or their bodies don't use insulin well, to turn food into energy. That causes sugar in the blood to rise, which can damage the kidneys and other organs — possibly the brain, researchers say. The new study, published in Thursday's New England Journal of Medicine, just tracked people and did not test whether lowering someone's blood sugar would help treat or prevent dementia. That would have to be tested in a new study, and people should not seek blood-sugar tests they wouldn't normally get otherwise, Crane said. "We don't know from a study like this whether bringing down the glucose level will prevent or somehow modify dementia," but it's always a good idea to avoid developing diabetes, he said. After nearly seven years of follow-up, 524, or one quarter of them, had developed dementia — mostly Alzheimer's disease. Among participants who started out without diabetes, those with higher glucose levels over the previous five years had an 18 percent greater risk of developing dementia than those with lower glucose levels. The effect of blood sugar on dementia risk was seen even when researchers took into account whether participants had the apoE4 gene, which raises the risk for Alzheimer's. 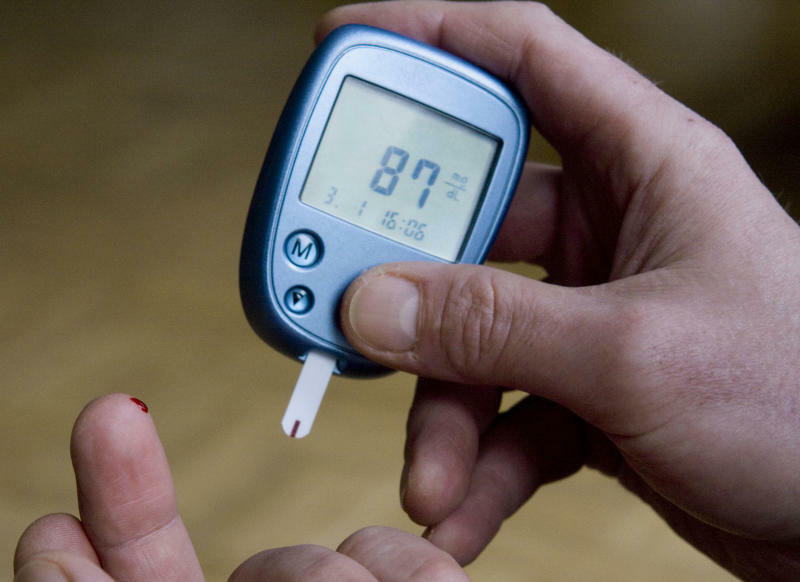 For those without diabetes, "it may be that with the brain, every additional bit of blood sugar that you have is associated with higher risk," he said. "It changes how we think about thresholds, how we think about what is normal, what is abnormal."